House Democrats can hold hearings on issues they want to push. They can seek to block the Trump administration's bid to expand offshore oil drilling and scrutinize EPA decisions, including the effort to roll back vehicle mileage and emissions rules. They can also offer bills and get them passed. None of these moves are likely to result in legislation that the Senate would approve, or much less that President Trump would sign. California's clout will be more nuanced and take time to strengthen. Still, the state that has helped lead the anti-Trump resistance will have more avenues to make its case against the administration. "They're two years away from having a chance at potential power becoming actual power," said Raphael Sonenshein, executive director of the Pat Brown Institute for Public Affairs at California State University, Los Angeles. "However, individual members will have a chance to chair important committees. The new committee chairs are going to be extremely important." Holding hearings can help change the congressional agenda, said Tom Epstein, a Democratic political consultant based in California and board member on the Coalition for Clean Air advocacy group. "Just having a platform for the first time in two years is really important to raise all these issues," he said. The Democratic Congressional Campaign Committee targeted GOP-held districts across the country, but specifically in California, where Hillary Clinton won more votes than President Trump in 2016. In California, it was a clean sweep, with Democrats winning all seven contests that were on their radar. 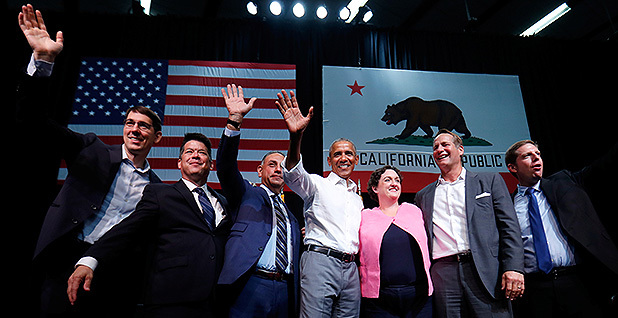 Democrats from California and elsewhere can refine the party's platform for the 2020 election, analysts said. One returning House Democrat from California sees that as a benefit. Passing bills in the House, even if the Senate won't take them up, "has the very important effect of drawing a contrast," said Rep. Jared Huffman (D-Calif.), who will start his fourth term in January (E&E Daily, Nov. 16). "That's something that people can take into 2020 and inform the voters and help drive the agenda," he said. "We can articulate a policy vision on many of these issues that is ambitious and feasible and also kind of exciting." However, one Republican warned Democrats take risks if they pass controversial bills the Senate won't move on. Democratic members in competitive districts could be tarred when running for re-election in 2020. GOP analyst Rob Stutzman compared it to Republicans who voted repeatedly to repeal the Affordable Care Act, also known as Obamacare, and then faced questions about it in the midterm election. "Are they going to shut down fracking" or take actions that would raise gasoline prices, for example, Stutzman said. "You'd be voting to ban fracking, but you're not going to ban fracking" if the Senate won't pass it, he said. "You're casting a potentially perilous vote to do nothing." Several returning and new members in interviews said they would be pushing for action on climate change. Others said they wanted to pursue angles that include water management policies, addressing wildfire risks and opposing expanded offshore oil drilling. Rep. Ted Lieu (D-Calif.), who returns for his third term, plans to introduce legislation calling for an 80 percent reduction in greenhouse gas emissions by 2050. It would give EPA the power to determine policies to do it. Lieu isn't dissuaded by Republican control of the Senate and White House. Trump has called climate change a "hoax." "My view is you never know what happens in politics; everything seems impossible until it happens," Lieu said. For example, 15 years ago, few would have thought gay marriage would be legal and several states would allow recreational marijuana use, he noted. "I don't think we can always predict when public sentiment shifts so dramatically that elected officials have to respond, and my view is we have to keep pushing," Lieu said. Lieu's bill, if it passes in the House, could hurt moderate Democrats in 2020, Stutzman said. "That's an example of an issue where you would find a lot of debate even within the Democrat conference," Stutzman said. He added, "A lot of Democrats are not going to vote to turn over the future of the U.S. economy to the EPA to promulgate regulations" on "the phasing out of energy uses." Rep.-elect Harley Rouda (D-Calif.), a real estate executive and Ohio native, said he plans to use a podium and microphone wherever he can to talk about climate. The political newcomer and onetime Republican defeated 30-year incumbent Rep. Dana Rohrabacher (R-Calif.), who does not believe in climate change. "We've got to raise the national understanding of how critical this is," said Rouda. Rouda noted that in Newport Beach — part of his district — the city is paying to raise the sea wall on Balboa Island. There's a larger plan there to ultimately lift the entire island because of sea-level rise (Climatewire, March 29). "I talk a lot about that in the district, that there's a reason Balboa Island raised the wall, and it wasn't because people were falling into the bay," Rouda said. Lawmakers need to draw connections between issues voters care about, such as climate and immigration, he said. "There are current projections, if climate change is not addressed by 2050, there will be 100 million climate change refugees worldwide," Rouda said. "That's an immigration issue in 32 years, beyond anybody's comprehension on how to deal with it. So they are interrelated." The same is true of health care, with higher temperatures, extreme storms and greenhouse gas pollution harming health, he said. Rep.-elect Mike Levin (D-Calif.), who ran as a "clean energy advocate," argued for more public education about warming. Levin won the 49th District, which stretches from coastal north San Diego County to southern Orange County. The seat is held by retiring Rep. Darrell Issa (R-Calif.). "We must re-educate members of Congress and the public regarding the dire conditions currently being accelerated by anthropogenic climate change," he said in an email. "This effort could include a variety of hearings across the country to bring to life recent reports, such as the recent Fourth Climate Assessment, which the Trump Administration has attempted to obscure." Huffman argued that the size of the delegation gives California leverage in several ways. "Just in terms of the practical effect, it means we will have more members on committees, more votes at the committee level, more influence within the Democratic caucus on the Steering and Policy Committee, and other places where key decisions get made," Huffman said. "It helps in every way." He added, "When one region has a whole lot of members, you tend to get allocated seats on key committees." Rep. David Valadao (R-Calif.), who was defeated in the midterms, is on the Appropriations Committee. His seat is "now available to a Democrat" from California, "or at least someone from the West," Huffman noted. Another defeated California Republican, Rep. Jeff Denham, is on the Transportation and Infrastructure Committee, a seat a Golden State Democrat could take. Huffman sits on that committee as well as Natural Resources. The larger delegation also creates leverage in getting votes on bills, Lieu said. Rep. Nancy Pelosi (D-Calif.), likely the next House speaker, agreed to a rule change for the next Congress that says if enough members sign on to a bill, it will get an expedited process to a vote. Those bills need 219 backers. "If you have a large state delegation, that gets you a portion of the way there already," Lieu said. Pelosi will want to help newly elected members in tough districts, to make them loyal to her and boost their re-election chances, analyst Sonenshein said. That includes the seven new House members representing onetime GOP districts in California, most of whom could be in tough re-election fights in two years. Pelosi has already named incoming Rep.-elect Katie Hill (D-Calif.) as a freshman representative on the leadership team. She beat Rep. Steve Knight (R) in the 25th District in Los Angeles County. The California House delegation "is bigger and more diverse than ever because people are demanding change," Hill said in an email. "In California, a huge part of that change is rooted in the need for serious environmental reform," she wrote. "The wildfires this Summer prove how dire the need is to put climate change at the forefront of our national policy truly." Also from California, Democratic Reps. Barbara Lee and Eric Swalwell will co-chair the Democratic Steering and Policy Committee, along with Democratic Rep. Rosa DeLauro of Connecticut. Lieu will co-chair the Democratic Policy and Communications Committee. Another California Democrat, Adam Schiff, will chair the House Permanent Select Committee on Intelligence. Rep. Maxine Waters will lead the Financial Services Committee, and Rep. Anna Eshoo is in line to chair the Energy and Commerce Committee Subcommittee on Health. Both Waters and Eshoo are veterans of the California congressional delegation, and both are Democrats. In addition to Pelosi as likely House speaker, California Rep. Kevin McCarthy is the Republican leader. Although Republicans will "be largely powerless for the next two years," having both leaders from California could boost the state in terms of money allocated for transportation, infrastructure or water, Stutzman said. McCarthy, in addition to his caucus shrinking overall, lost half of the Republican California representatives. Out of California's 53 House members, just seven will be in the GOP. That weakens him for now, analysts said. "McCarthy comes in as minority leader with real deficits," Sonenshein said. However, "he'll be a player because there's a Republican in the White House, a Republican who likes him very, very much." McCarthy's office did not respond to repeated requests for comment. Stutzman said McCarthy could play a role in helping persuade the Senate to take up a House bill that has bipartisan agreement, such as one on water or infrastructure. However, he'd have to weigh whether to give Democrats that win. "The question is, is McCarthy going to expend any [political] capital for his state?" Stutzman said. "That is an open question."